This is an effective training device when worn under supervision as it distributes correction pressure evenly around pet's neck. Argon welded and chrome plated for maximum strength and durability, this collar easily adjusts for a proper fit by simply additing or removing links. 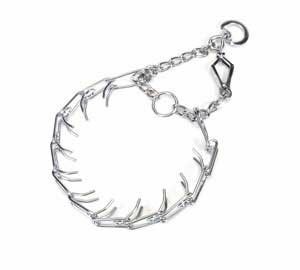 Featuring a quick release snap this training collar has 3.3mm diameter links with an overall collar length of 20. If you have any questions about this product by Coastal Pet, contact us by completing and submitting the form below. If you are looking for a specif part number, please include it with your message.